It is estimated that there are over 600,000 wild turkeys in the Hill Country and they are well adapted to living in the country around the Escondido Ranch. 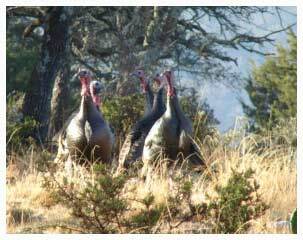 The main species is the Rio Grande Turkey, which is typically a very light to medium brown in color over the body. The feathers are tipped with a lighter color of buff or yellowish buff colors. On toms the head is white and the waddle is very dark red and highly visible. The average Rio Grande Turkey will measure just over 4 feet tall and weighing about 20 pounds at maturity with the hens being significantly smaller. The hen's coloration is lighter with the body being a coppery color with pinky-buff colors on the tips of the feathers of the breast. The natural habitat of the Rio Grande Turkey will range from open plains to alongside brushy areas. They are also found as high up into the mountains as 6000 feet, making them one of the more widespread game bird species. They are often found in flocks along riverbeds, creeks or streams, especially in the mesquite brush that surrounds these areas along the Rio Grande River and other Texas waterways. In some areas the flocks may be upwards to 100 birds, usually during the winter season when they move together. In the summer seasons individual toms and hens are more commonly found in smaller groups, typically around cottonwood stands. The hen will roost in nests in cottonwoods almost exclusively, which can make determining nesting areas and tracking numbers much easier. Since they do move between the winter and summer areas many of the hens and toms will return to the same tree to continue to nest year after year. While they do live in rather dry areas they prefer climates where the average yearly rainfall is 16 to 30 inches per year. They will eat grasses, insects and forbs, which are herbaceous, flowering plants that are native to all parts of the southern United States and other geographical areas. Hunting turkeys in the spring typically begins with an early morning start to get hunters to the roosting and calling areas before the first signs of sunrise. Callers pretending to be hens can attract the huge toms within shotgun range and they will move towards areas where they think these new hens are waiting. The sound of the turkeys drumming and gobbling is amazing, as is their display of fanned tail feathers as they approach the area where they think hens await. After these early morning hunt there are also options for walking the brushes and wooded areas and calling to attract individual toms to come out into the open. There is also the possibility to use turkey decoys and blinds for those hunters that prefer to sit and wait for the toms to approach a call rather than walking. Fall turkey season coincides with whitetail deer season, and is normally done out of blinds overlooking feeding areas. 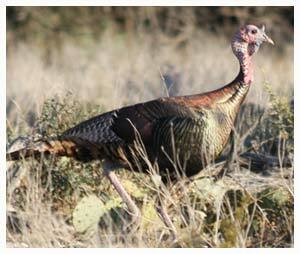 In the Hill Country, home to the Escondido Ranch, wild turkeys are both a popular species and a popular hunting bird. They can be heard loudly gobbling in the early morning hours and they make an excellent day hunting option for novice and experienced hunters alike. Turkey hunting seasons are in both the spring and the fall.